Every so often something new and better comes into the sport of sailing. And there always is a need for it. Many new skippers like to start right in on all the excitement, but that need is greatest for those who have gone so far in the normal type of single handed sailing craft, and would like something more demanding and thrilling to sail. The 3.7 offers the obvious excitement of single handed trapezing, which gives ordinary sailing a whole new dimension. 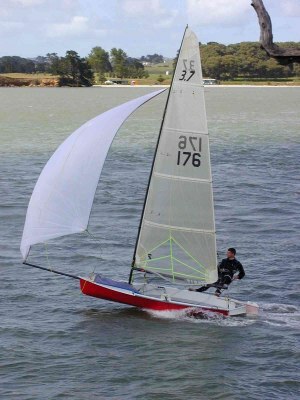 And for light airs when trapezing is not possible, it is still a quick, responsive, and pleasant boat to sail. Sea Spray boats test (May 1971) described handling characteristics and all round performance as excellent. The 3.7 is a single handed trapeze centreboarder, with hard chine, rounded sections, full bow, straight run, and generous beam.